A drive of about two and a half hours from Thimpu arrives at the Dochu La Pass, just east of this Amankora Punakha is accessed by crossing a suspension bridge over the Mo Chhu or Mother River. 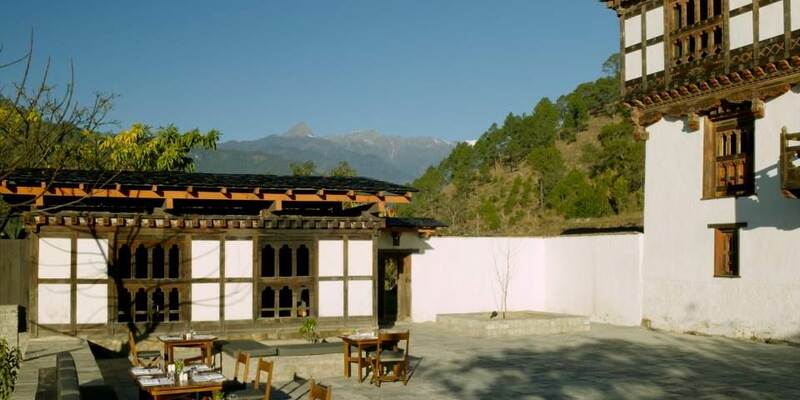 Guests either walk or drive to the lodge, which includes a traditional Bhutanese farmhouse originally built as a residence by a former Chief Abbot. This three storey structure has well preserved wall paintings done in vegetable dyes and is now the main area of the lodge. On the ground floor of the original building The Dining Room inside and in temperate months, The Courtyard outside are delightful venues in which to enjoy delicious cuisine. A Tea Pavilion, adjacent to the Courtyard was once the kitchen of the summer palace.The upper floors have intimate areas for relaxation together with a traditional altar room for prayer and meditation. The emphasis at The Spa at Amankora Punakha is on the spiritual path towards healing using meditation and the age old treatment of Reiki, delivered by Bhutanese therapists the energy that flows through this treatment is universal. There is much to see around Amankora Punakha, which was, for 300 years, the winter capital of Bhutan. One of the highlights of Punakha is the impressive Punakha Dzong, home to the remains of Bhutan’s first ruler; it is situated at the confluence of the Mo and Pho rivers. Within the area of the dzong there are twenty one temples, the largest of which is the hundred pillared Great Assembly Hall of the monks. 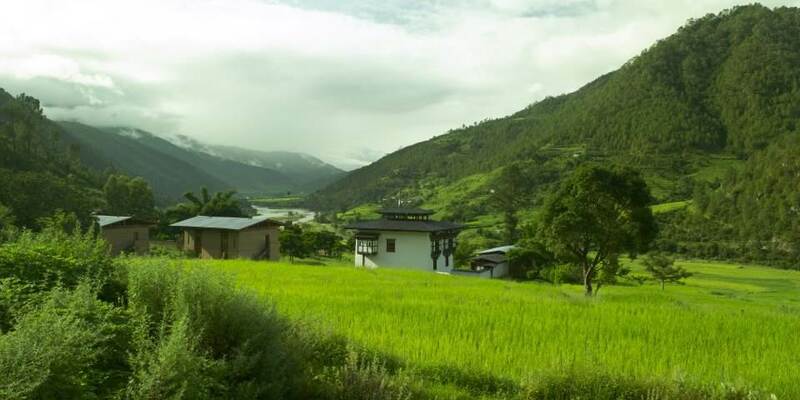 The Punakha valley, at only 1,300 metres is one of the lowest lying in Bhutan and its temperate climate makes it the market garden of the country with food being produced the whole year round, indeed in wintertime many Bhutanese come here to reside during the colder months. 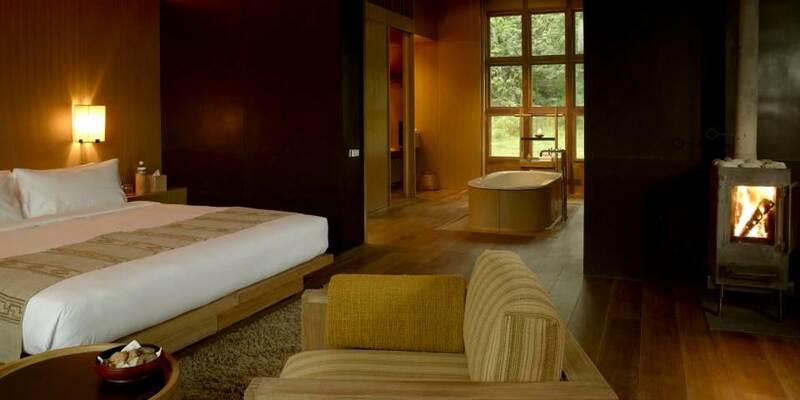 The 8 suites, situated in three rammed earth buildings, have a beautiful location in an orange orchard with views up the valley and across rice fields. 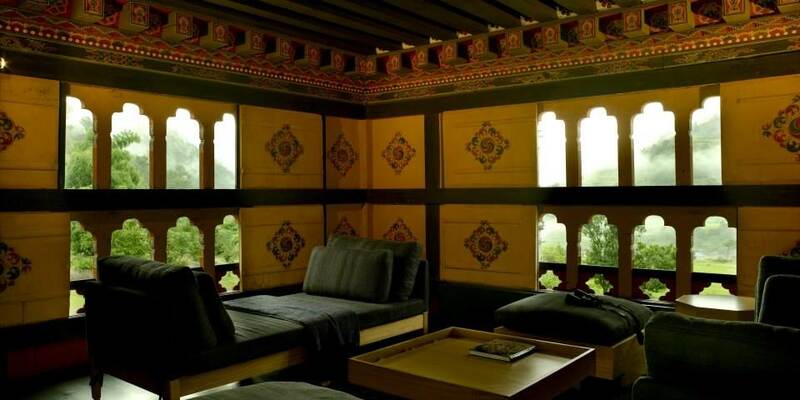 Identical in design to those of Amankora Paro, each is furnished with a king size bed, reading chair and a banquette window seat, a traditional bukhari or wood burning stove is situated in one corner. The bathroom opens from the bedroom and is dominated by a large terrazzo clad bath; one side it is flanked by twin vanities, on the other a separate shower and toilet.